Jobs that undocumented immigrants hold. A growing number of undocumented immigrants are landing managerial positions. At the same time, fewer are doing jobs that require manual labor. 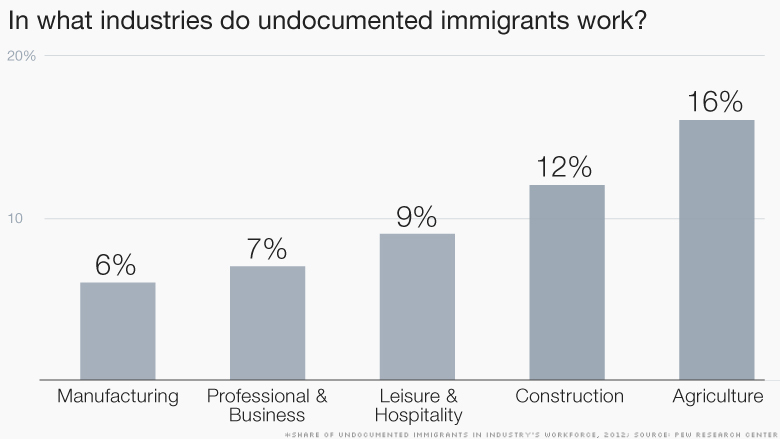 Some 13% of undocumented immigrants had management or professional jobs in 2012, up from 10% in 2007, according to a new Pew Research Center report. Meanwhile, 29% held construction or production posts, such as a food processor, garment worker or machinist, down from 34% in 2007. The transition reflects a shift within the undocumented population in recent years. More than six in 10 of these immigrants have been in the U.S. for a decade or longer, compared to just over three out of 10 in 2003. That's because there have been more undocumented workers leaving the country than coming into it, especially since the Great Recession, when many job opportunities dried up. Since 2007, about one million undocumented workers have left the U.S., said Jeffrey Passel, senior demographer at Pew. 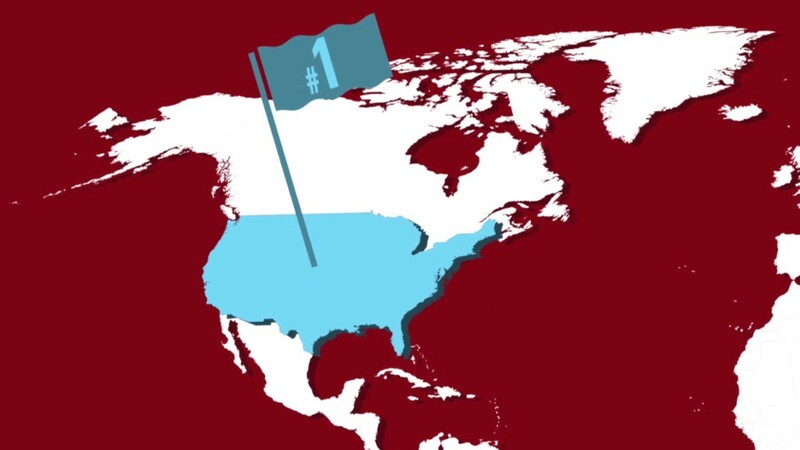 There were some 11.2 million undocumented immigrants in the U.S. in 2012. It's not surprising that some undocumented immigrants are taking on more responsibilities at work the longer they stay in this country, Passel said. The most common managerial positions for these workers are in food service and farming and agriculture. Although it's illegal for undocumented immigrants to work in the U.S., many find ways to circumvent the rules. Some came here legally, but overstayed their work visa. Others use forged documents. Still others work off the books or as day laborers getting paid in cash. And some companies don't verify the information they receive. Still, the majority of undocumented immigrant workers continue to toil in agriculture, construction and hospitality. Also, they are more likely to hold low-skilled jobs than their native-born counterparts. For instance, some 62% held service, construction and production posts, twice the share of U.S.-born workers. 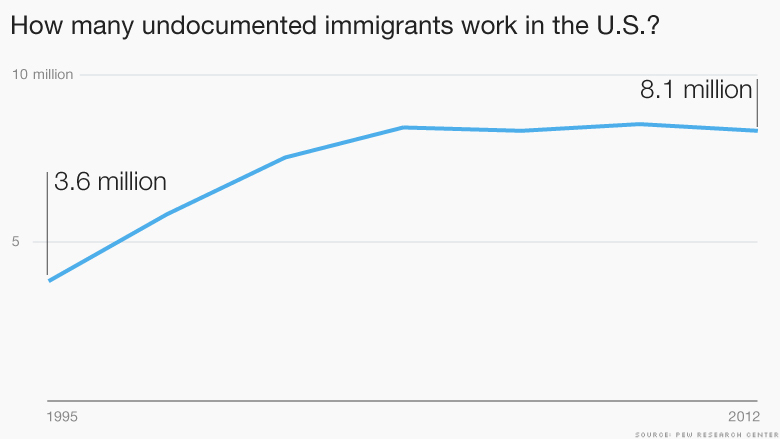 And while undocumented immigrants are climbing the job ladder, they still lag behind those born in the U.S. Though 13% of these immigrants were in management and professional jobs, some 36% of U.S.-born residents held these positions. Overall, the number of undocumented immigrants working or looking for employment has remained somewhat constant in recent years at 8.1 million. That's about 5.1% of the civilian labor force. Undocumented men were more likely to be in the workforce than their American-born counterparts, 91% vs 79%. 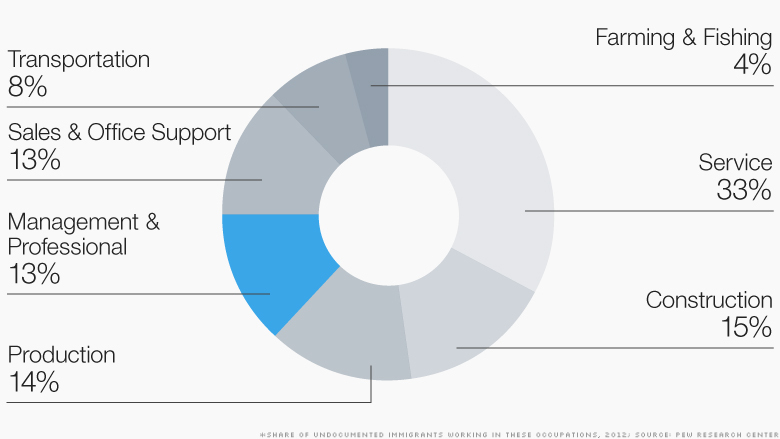 But only 61% of undocumented women were in the workforce, compared to 72% of U.S.-born women. The Pew report also gives insights into where undocumented immigrant workers live and from which countries they come. Nevada had the highest share, at 10.2%, with California and Texas following at 9.4% and 8.9%, respectively. Just over half of undocumented immigrants were Mexican, with Salvadorans and Guatemalans next. Overall, undocumented immigrants made up 3.5% of U.S. residents and 26% of all immigrants.